It’s sheer intellectual laziness to tar Prof. Chinua Achebe’s book as the result of a “pathological hatred of theYorubas”. But like someone said earlier, lots of folks don’t read their Bible, but still spout the mantra “it is loaded” – simply because the pastor said so. Lay aside the dogma you have been fed by UPN/AG since your primary school days – ostensibly in an environment influenced by people who were products of “Papa Awo’s welfare state. Do not take my comment as an “attack on Yorubas”, for the same practice abounds across Nigeria where some folks still probably believe Nnamdi Azikiwe had the keys to the River Niger or that Ahmadu Bello had a halo under his turban. Check the facts expressed in Achebe’s book (or if you want to rely on third hand information, check that the third-hand information indeed came from the book). There are two strands of issues here – 1) things Awo said or did ; and 2) Achebe’s opinion of those acts. The first strand can be easily verified – it’s either Awo did those things or he did not. In this case, there is a plethora of reference materials written by other people – including non-Nigerian observers and historians – confirming that Chief Awolowo did and said those things. On the second strand, Prof. Achebe is entitled to his opinion; if you disagree, tell your own story. Express your opinion. 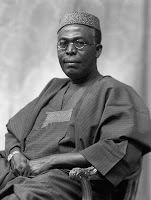 You are free to write -“In my opinion, Chief Awolowo received divine revelation on how best to contribute to the Nigerian effort in the civil war, which he did with angelic faithfulness”; brilliant. I will read your book. Chief Awolowo had at one point or another tried to explain the blockade policy from his own perspective, which he again was entitled to do. What then bars someone else from expressing a contrary view of the same events that we all can verify actually happened? Chinua Achebe has his faults – both personal and within the body if his literary works – but to pass these off as “pathological hatred of the Yorubas” is laziness. Even the residue of the AG/UPN propaganda machine that Chief Adebanjo represents can find a better basis to critique Achebe’s work if they were not so indolent in their view of other ethnic groups. My view is simple – the strengths of the country do not lie with any single ethnic group. We are like a tapestry – an until we stop seeing ourselves as individual wefts and warps we are going to continue having this mindless “Igbo/Hausa/Yoruba/200 other ethnic groups” yarn. Temitope Adeyinka I absolutely agree with Tèmítáyò‘s last comment…Achebe, as an active participant has rendered a verdict of his personal impression about Awolowo’s actions. Bottomline is we more often than not, judge people by their actions, while we judge ourselves by our intentions. In the end, we’ll not reach a consensus on this matter, because it bothers on emotions, heritage and large doses of sentiments. PreviousPrevious post:FLOOD! FLOOD! FLOODED NIGER DELTA!NextNext post:AHOADA FLOOD VICTIMS CRY OUT FOR HELP!! !